These porcelain pots are based on traditional designs and enable you to re-create the charm and elegance of the Victorian bathroom or dressing table in your own home. The lid design is in cobalt blue, which has been premanently fired into the pot lid. 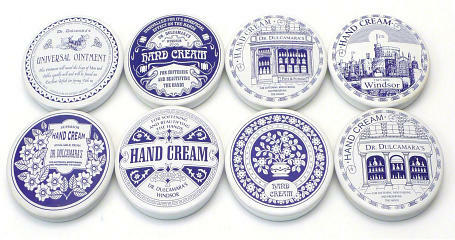 Each porcelain pot is about 10cm (4 inches) across and contains 70g (two and a half fluid ounces) of hand cream. Each pot comes packed in a navy blue box. They make an ideal gift either for your self or a special friend. When empty, you can use them as trinket boxes or refill them from one of our hand cream tubes.